Fresh off the release of the Ron English and Mark Dean Veca-designed figures, Kidrobot is back at it — this time with a spicy take on its signature Dunny. Blind boxed, the $14.99 USD sriracha bottle Dunny will soon be available via Kidrobot’s web store in limited quantities. Working from the base of Huy Fong Foods’ favorable “Sriracha” chili sauce packaging, multi-brand store BAIT has teamed up with Medicom Toy and graffiti artist Sket One to produce a new 100% and 400% Bearbrick collection. Marking Huy Fong Foods’ first ever Medicom Beabrick rendition, one ear from each size is presented in bottle cap green with a monochromatic red “natural color” body that has been completed with the usual white ingredient labelling across its back detail. The sauce’s rooster logo that bears reference to founder David Tran’s Chinese zodiac symbol has been printed across the chest compartment of each bear. Exclusive to this year’s San Diego Comic Con from July 4 at BAIT’s booth, the 100% and 400% “Sriracha” Medicom Bearbrick collection is scheduled for a yet unspecified online release and comes packaged together as a set for $125 USD. Stay tuned for further updates. Sriracha fanatics around can now enjoy their favorite condiment in a new form. Seattle-based company Pop! Gourmet Foods has recently partnered with Huy Fong Foods, the makers of the original Sriracha, for a line of foods actually made with the hugely-popular sauce. Already selling Sriracha-infused popcorn, the two will also be releasing potato chips, along with croutons, tortilla chips, hummus and more, all incorporating the Huy Fong product. The most versatile offering to come out of the partnership will be a powdered spice mixture made from a base of dehydrated Huy Fong Sriracha. The chips will be available April 8 for $4 USD, and the powdered Sriracha will be available April 20 for $5 USD. All products will be available in Kroger supermarkets and Bed Bath & Beyond stores. 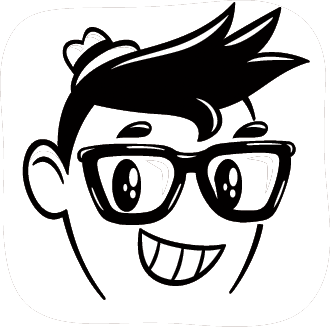 For more information, visit Pop! Gourmet Foods. Corner Bakery is adding a new soup to their lineup that incorporates both east and west. Of course, when most things boast an Eastern kick, they’ve gotta involve sriracha. 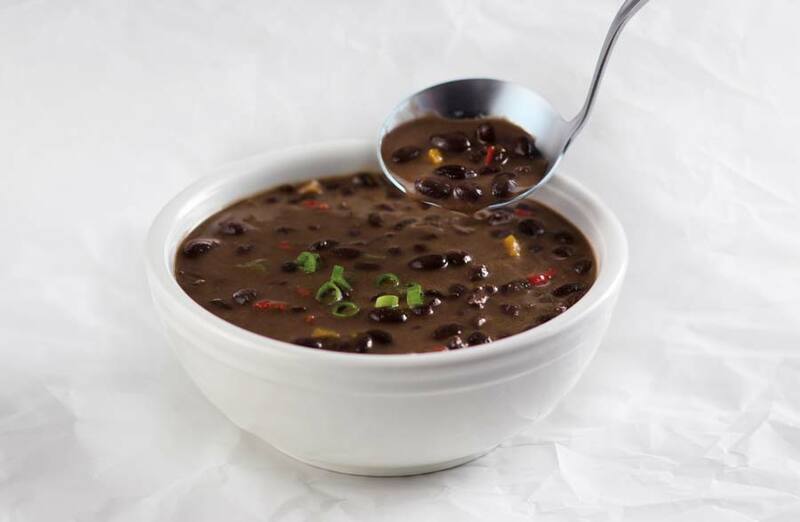 The bakery chain is now offering a new Sriracha Black Bean Soup. The vegetarian dish is made with black beans, onions and garlic. It’s simmered in a vegetable stock and splashed with lime, coconut milk and a sriracha sauce. The soup will be a companion for Corner Bakery’s relatively new Spicy Asian Pork sandwich. The sandwich is made with fire-roasted pork that’s sautéed in a spicy Asian BBQ sauce and topped with cucumbers, a spicy slaw, cilantro and house-pickled jalapeños. A while back, everyone and their moms became really invested in candied Sriracha bacon onion rings. The only downside was, now matter how delicious, the recipes actually took some time to make. While wandering purposefully through our local Trader Joe’s, we discovered a curious bag of Sweet Sriracha Uncured Bacon Jerky. 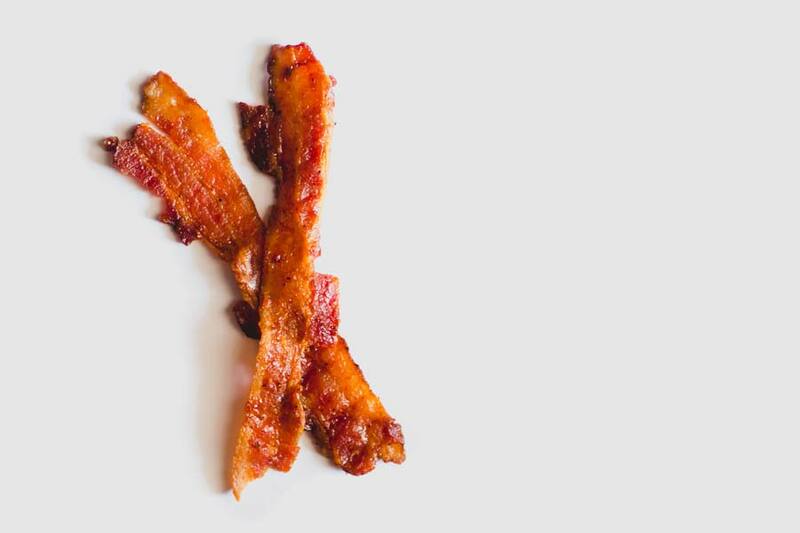 To our sriracha-coated glee, the jerky tasted phenomenal. It perfectly captures the magic of those sriracha rings, but with none of the kitchen mess. Sure, it’s missing the onion bit, but was that really anyone’s favorite part of the recipe? 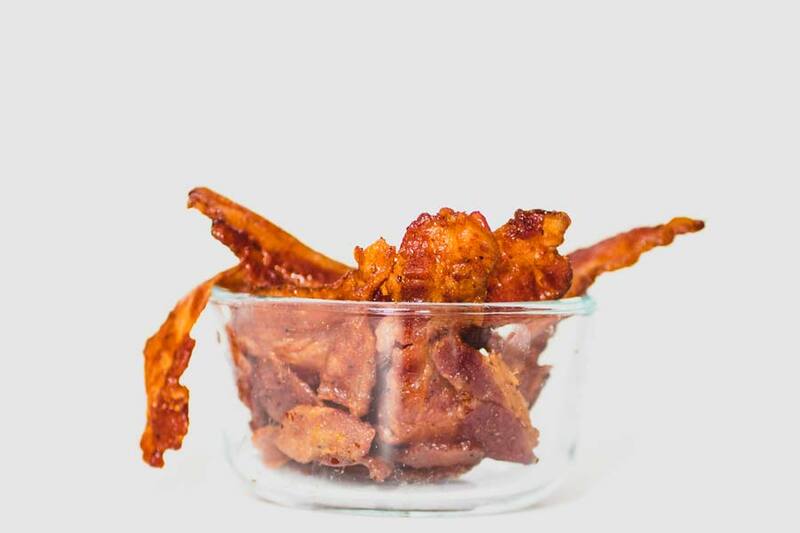 The bacon jerky is made with a combination of sriracha-style sauce, honey, soy sauce, garlic, ginger and spices. One might wonder what the difference between cured and uncured meat could be. Essentially, uncured utilizes natural preservatives. It’s still cured, they just call the process “uncured” for some reason. You can find a bag for about $5.49 at your local Trader Joe’s. It’s a little costly, but what jerky isn’t?